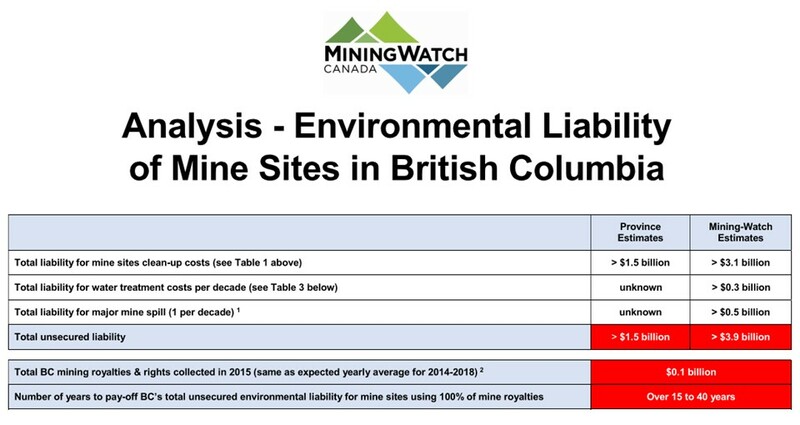 (Ottawa) MiningWatch Canada today published a new analysis showing that British Columbia (BC) has the largest unsecured environmental liability for mine site clean-up costs when compared to the two other main mining jurisdictions in Canada: Ontario and Quebec. BC’s total unsecured liability amounts to $1.5 billion, compared to $1.4 billion for Ontario and $1.2 billion for Quebec (see Table 1 in analysis, using provincial figures). “This means that British Columbians are disproportionally more on the hook for cleaning up the mess left behind by the mining industry,” says Ugo Lapointe, Canadian program coordinator for MiningWatch Canada. In her recent report, BC’s Auditor General, Carol Bellringer, did not investigate the liability of abandoned mine sites, which is under the responsibility the Ministry of Forests, Lands, and Natural Resources Operations. Based on a cross-analysis of available data disclosed by different BC institutions in recent years, MiningWatch’s analysis reveals that BC’s current cost estimate for cleaning-up abandoned mine sites ($0.3 billion) does not include 27 abandoned mines and over 1100 mine site hazards. “When looking at similar site categories in Ontario and Quebec, this represents a gap of at least half a billion, and possibly over one billion dollars, in unreported environmental liability that BC taxpayers may have to pay,” predicts Lapointe. When taking into account water treatment costs, and considering the costs associated with one major mining spill every decade — half of what the Mount Polley Review Panel predicted — MiningWatch estimates BC’s total environmental liability for mines to be over $3.9 billion (see Table 4 in analysis). “At the current rate to which BC collects revenues from mining royalties, it would take 40 years to cover this liability. Clearly, BC’s mining model is unsustainable and must change,” insists Lapointe. MiningWatch supports both the Auditor General’s and the Union of BC Indian Chiefs’ (UBCIC) recommendations for a stricter, independent environmental oversight of the mining sector, as well as a much stronger financial security regime that would ensure that the public is never left to foot the bill to clean-up contaminated sites. MiningWatch points to the Northwest Territories, Manitoba and Wisconsin as examples of jurisdictions not allowing new mines that require long term water treatment, as well as Quebec and Alaska for their stronger financial security regime. In UBCIC’s recent report, the author and economist Robyn Allan also recommends insurance models that include national and international industry pools to cover damages from major accidents or spills. Such models already exist for other industries, but not yet in the mining sector.